Our Marathon months are over, and we are headed north once again. We continue to get reports of snow and ice and freezing temperatures from Maryland, so we will do everything we can to haul spring with us as we go. Just a few notes here. 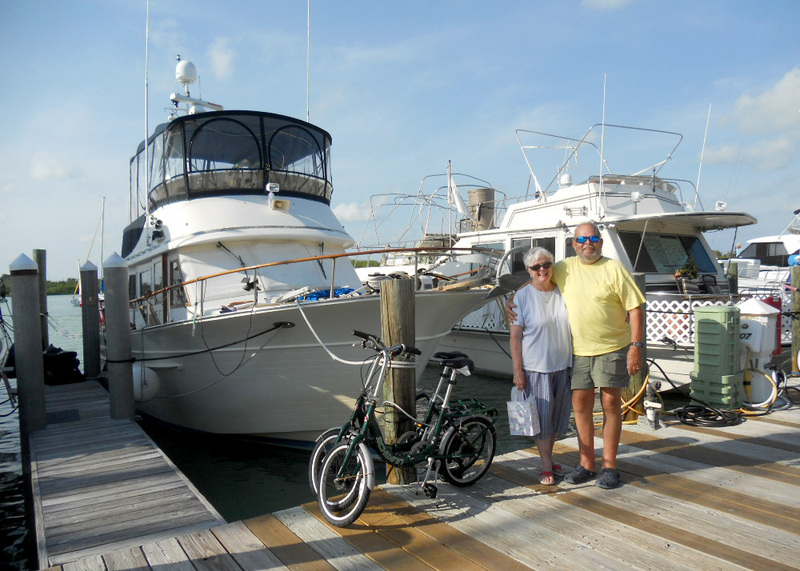 . .
We basically “parked” the boat in Marathon, at Sombrero Dockside Marina. Quite an interesting place, as the tiki bar was open this year, and there was lots of music and traffic. Sunday night was our least favorite, as it was “open mic,” and not all guests were stellar performers. 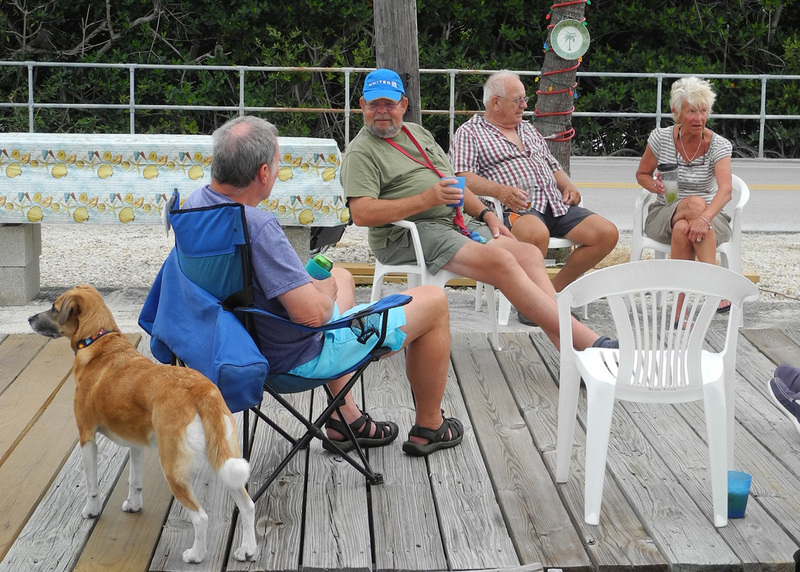 Every evening at about 4:30 or 5:00 we gathered on the dock in front of our boat. 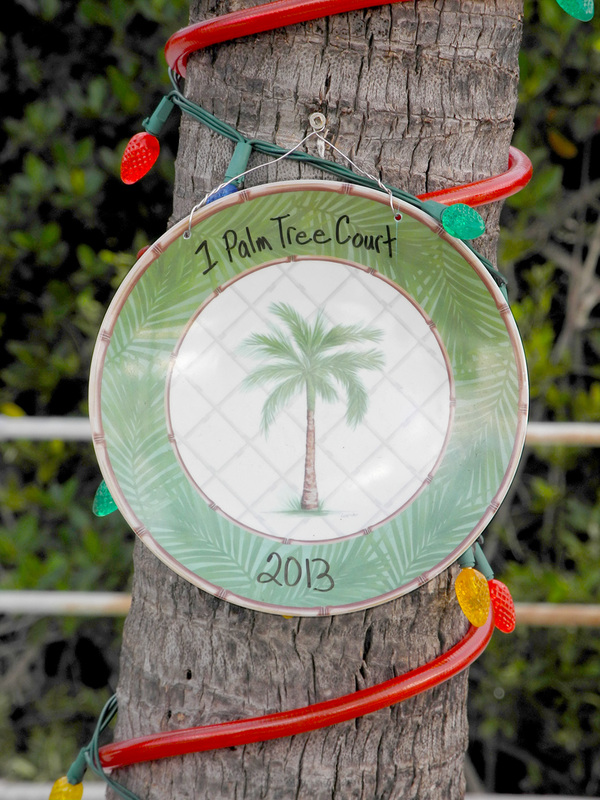 Last year the gathering place was named “One Palm Tree Court,” and we decorated the palm with Christmas lights. They’re still there! 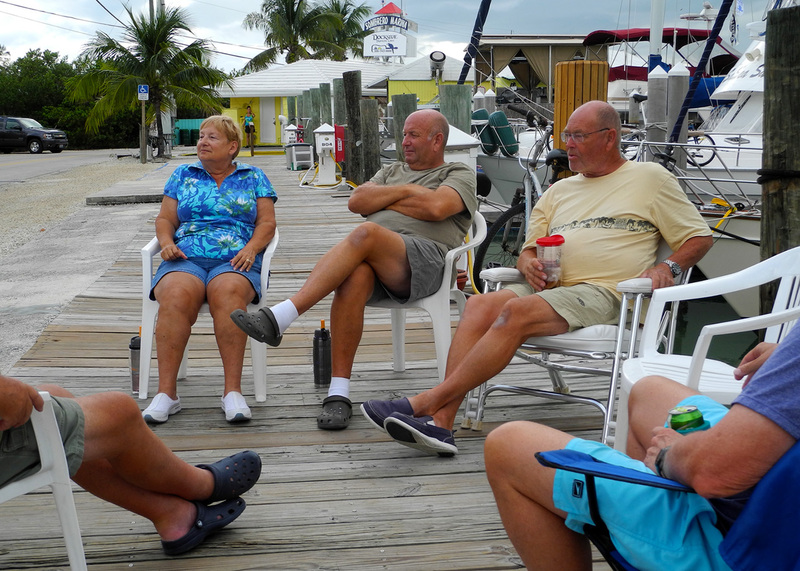 Attendees of this informal “docktail party” varied with who was at the marina. . . boats come and go all season. Our little dog Niya came to love this time of day. If we didn’t let her join “the guys on the dock,” she would whimper and cry. You can see here how close we were to the Dockside Tiki Bar. 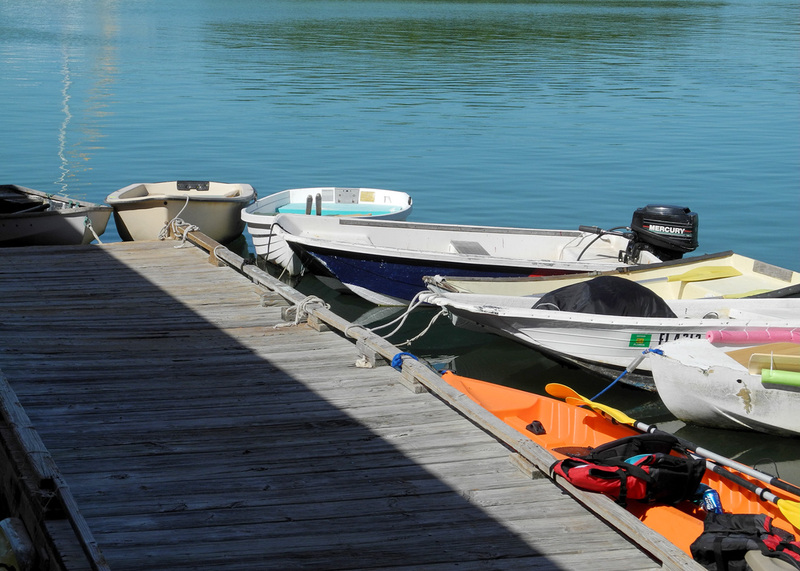 The dinghy dock at the marina served many of the folks who live on their boats in the mooring field. 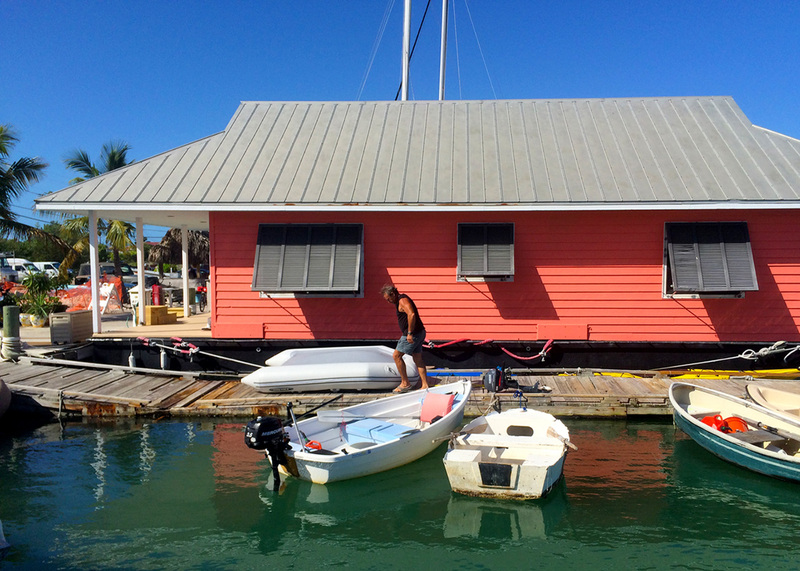 The people that live right next to the dinghy dock painted their house this winter. The color was wonderful, as you can see. The ceiling of the front porch was a pale blue. Perfect! 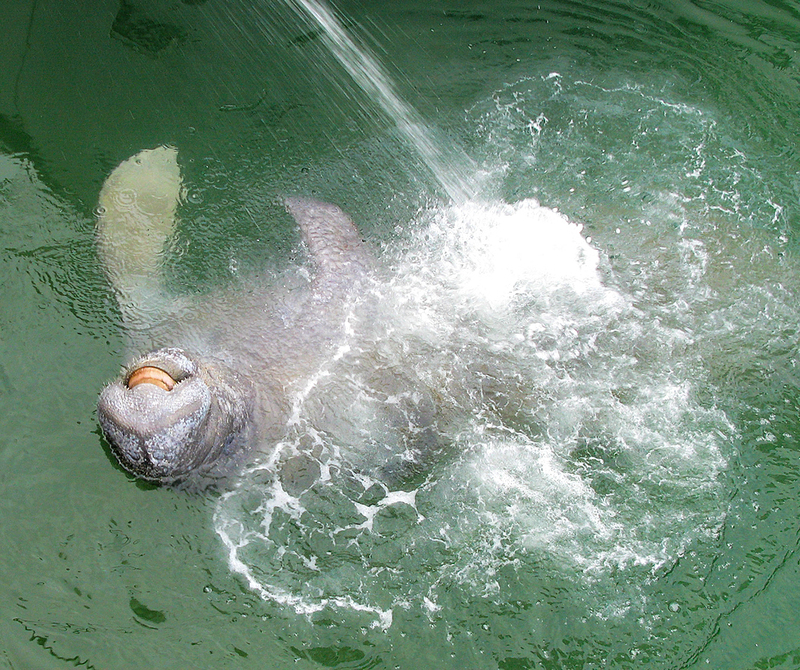 I didn’t get any pictures of the manatees this year (remember from last year? ), although they visited several times a week. Once we even had a mom with two babies, both of whom were nursing! This is what they call a “manatee footprint.” They come up to the surface briefly to breathe, and disappear again. Several times we saw “flights” of Leopard Spotted Rays. Wish I could claim credit for this shot, but I took it from the Internet. 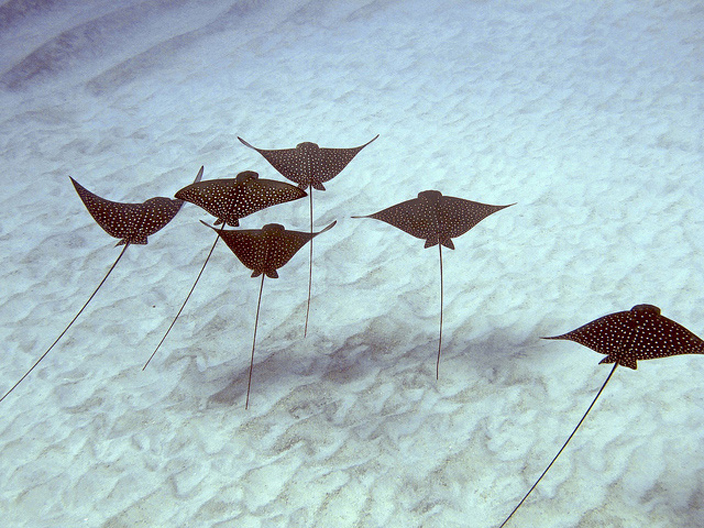 They swim in formation exactly like this, and are truly lovely. And almost every day we were visited by needle fish. 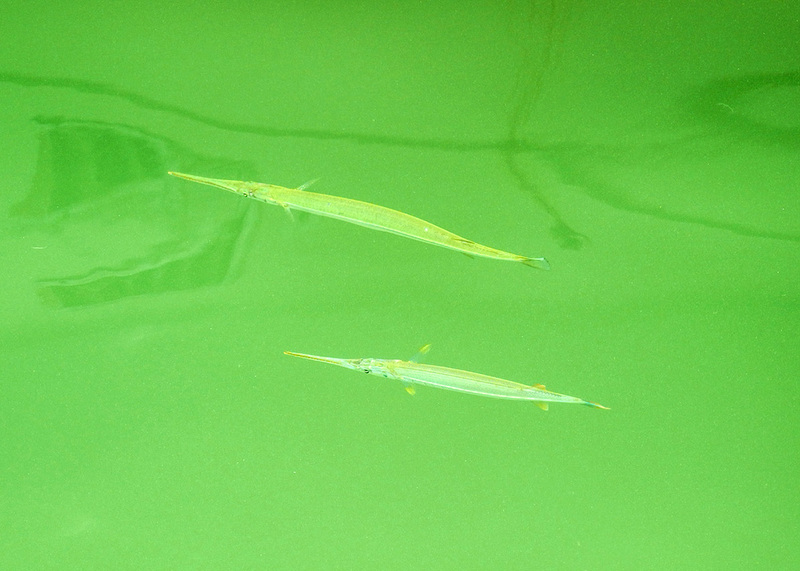 These are the same little guys that “skip” through the water on their tails in this photo from an earlier blog post. 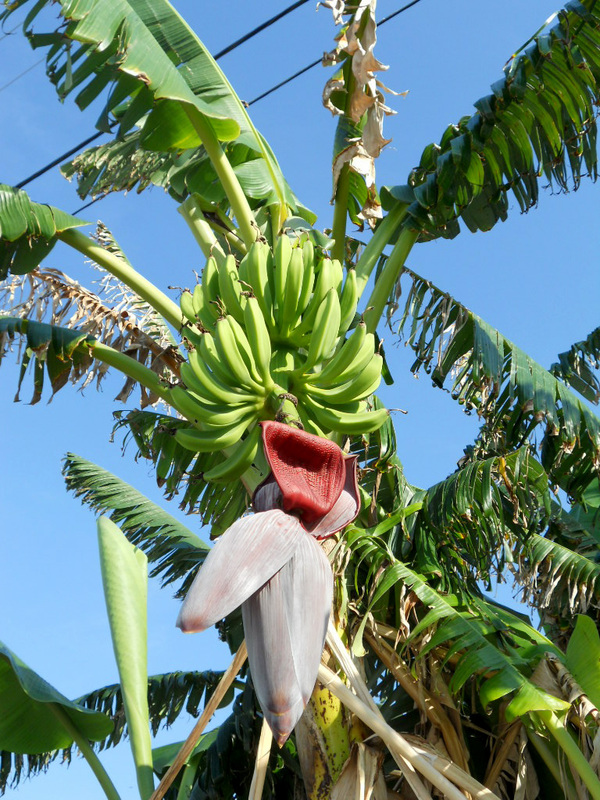 Among the palms along the fence across the street there are some banana trees, and this year we were surprised by some fruit. Odd looking “bloom,” this thing opened one or two of its leathery petals every day, and dropped them over night. Very strange! We left before the fruit turned yellow, so I don’t know if it’s any good for eating. 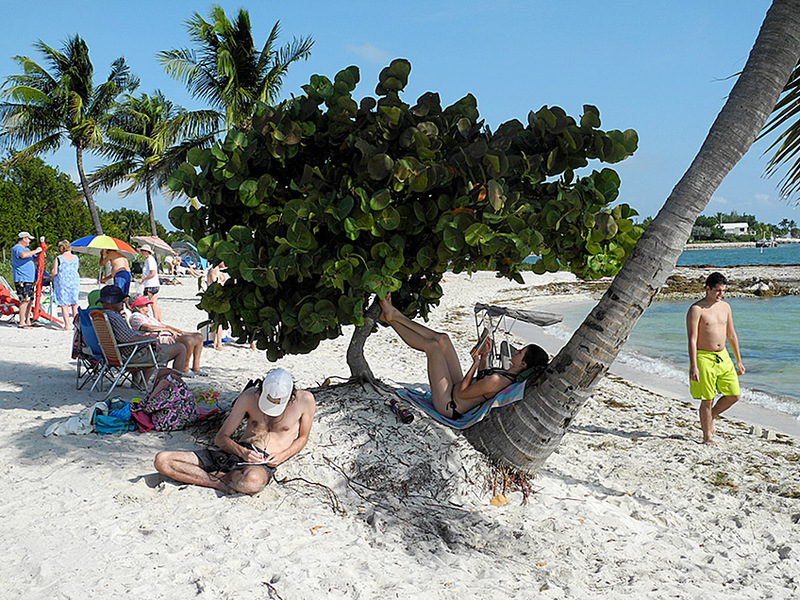 Sombrero Beach is only a couple of miles from us, and is one of the top ten “Must See” places to visit in the Keys. 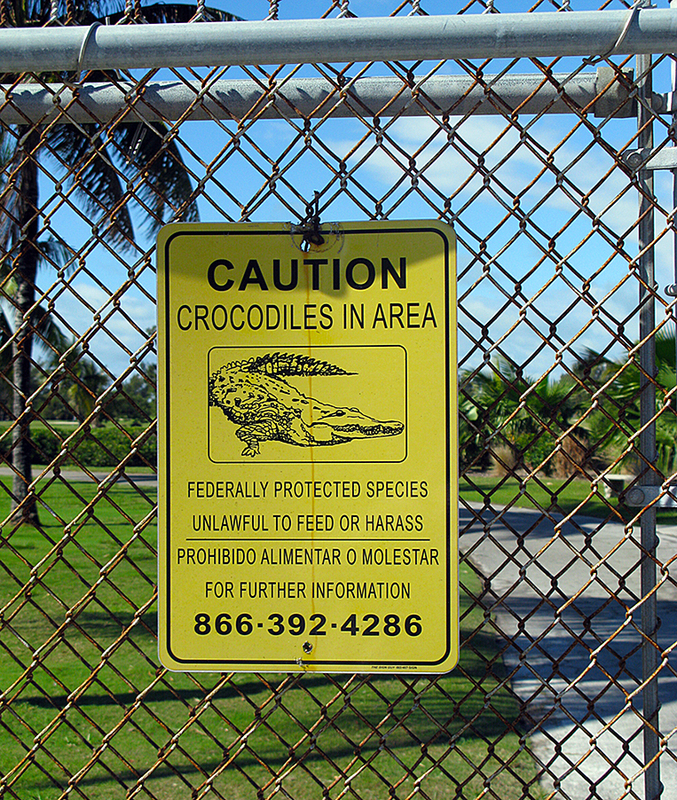 Evidently Crocs, which we have in Marathon (remember this from last year?) 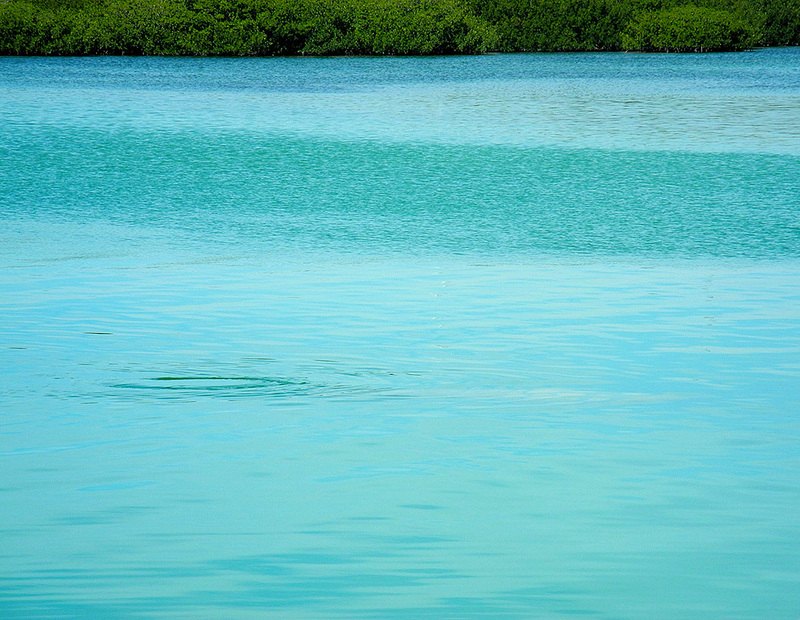 are okay with salt water, and alligators prefer fresh. So we have both here. 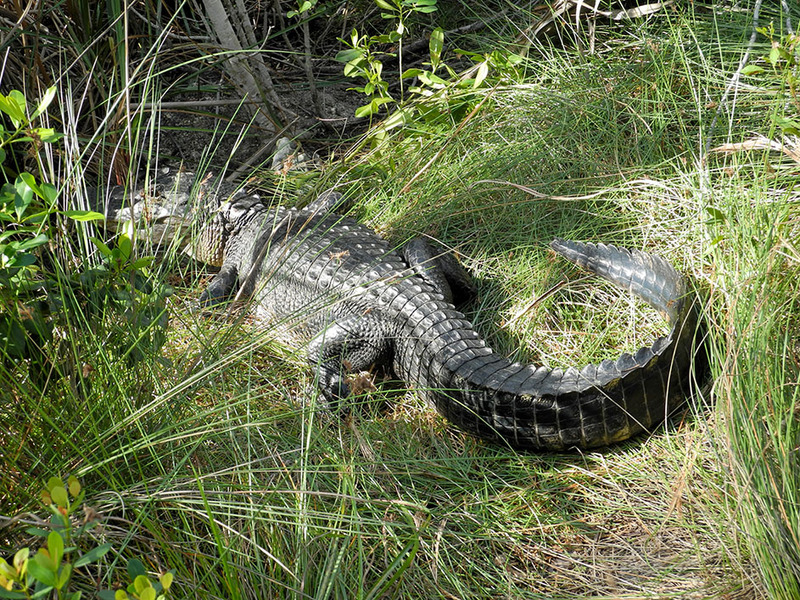 This is one of the alligators that live in “The Blue Hole” (a fresh/salt water pond) on Big Pine Key. Unfortunately they’ve become accustomed to people, so they’re not very shy. Watch out! 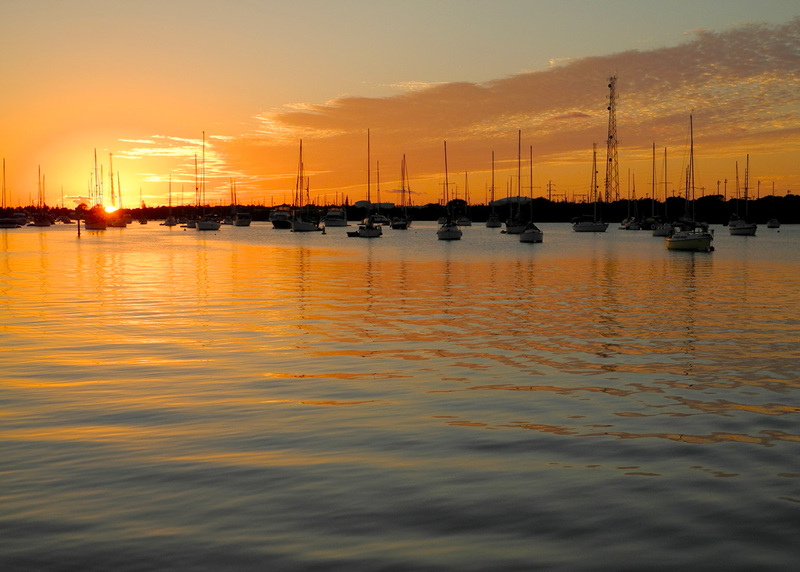 And always we are looking out over the Mooring Field of Boot Key Harbor to watch storms. . .
. . . and sunsets. There are several people out in the mooring field who blow their conch shells every night as the sun drops below the horizon. Very cool. 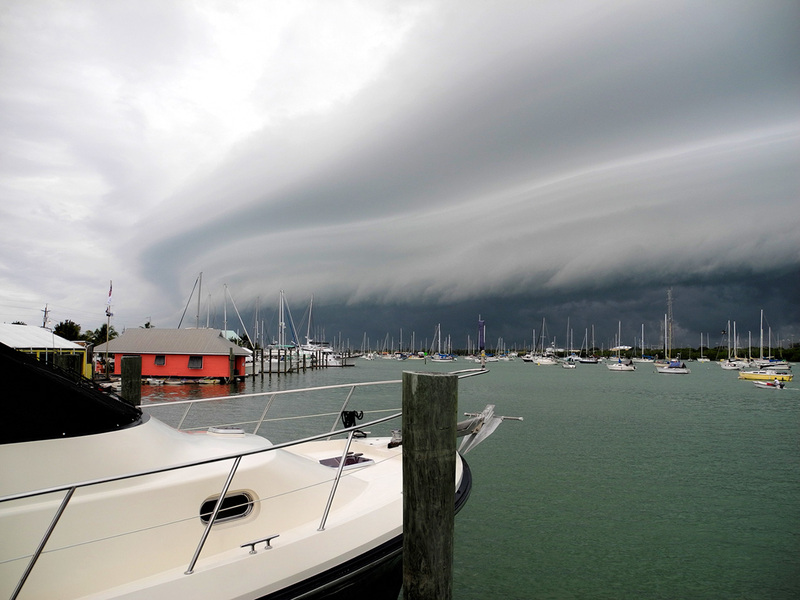 This entry was posted in Making "Good Times" as we head south by ChesapkLady. Bookmark the permalink. We’re at Wrightsville Beach in North Carolina. At anchor. Winds have finally come down off the twenties to somewhere around 12 knots. Thank god! 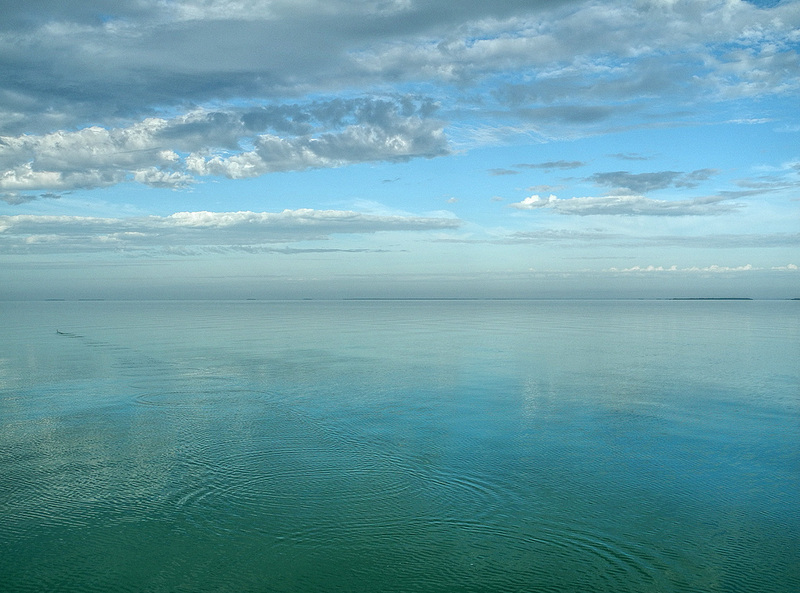 We think we’ll be at Mile Hammock Bay tomorrow. What are your plans? We’re guessing we’ll cross paths SOON!